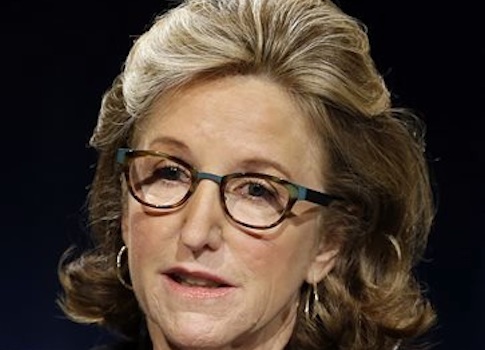 During a Wednesday interview, Kay Hagan blamed her 2014 defeat to Sen. Thom Tillis (R., N.C.) on "money in politics," despite the fact that she spent more than twice as much money as Tillis and that outside groups supporting her far outspent groups supporting Tillis. Hagan spent more than $24 million during her reelection campaign and Tillis spent less than $11 million, according to the Center for Responsive Politics. Last month Hagan began teaching a class on "Money in Politics" at Harvard’s Kennedy School of Government. The description for the class, "Money in Politics: How the New Norms Affect Campaigns, Legislation, and Political Life," states that "Hagan brings a unique perspective to the real-world effects of changes in the way money impacts modern campaigns." It adds that she had "just run and lost the most expensive Senate race in U.S. history." Joining the class as a guest lecturer was Hagan’s campaign lawyer, Mark Elias, who has been employed by multiple Democratic candidates and Super PACs, including Sen. Harry Reid’s (D., Nev.) massive Senate Majority PAC. During the 2014 cycle alone, Elias’ law firm took in $951,441 from the Democratic Congressional Campaign Committee, and $825,576 from the Democratic National Committee. Hagan has blamed her loss on President Barack Obama’s failure to take credit on behalf of his party for an improving economy. Hagan, however, did her best to avoid any connection to Obama during the campaign, even refusing to answer whether or not she wanted him to come to North Carolina to assist with her campaign. Hagan’s campaign was marred by scandals, such as her choice to attend a New York City fundraiser instead of a classified ISIS hearing and her husband’s taking in roughly $400,000 in government stimulus money. Hagan did not give a definitive answer when asked during the interview whether she would run for office again. This entry was posted in Politics and tagged 2014 Election, Kay Hagan. Bookmark the permalink.